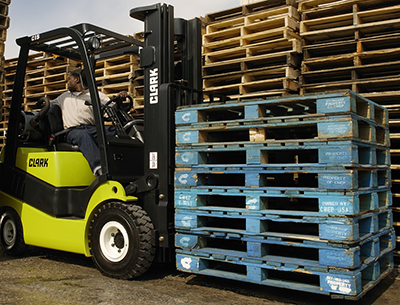 The smallest of Clark’s diesel/LPG pneumatic tire lift trucks has a low lift capacity, but its design goes beyond innovation and intelligence. The LPG or diesel engine makes this lift truck a powerful machine. Its narrow width allows the forklift to navigate tight areas. Its pneumatic tires are ideal for manufacturing, recycling, warehousing and trucking applications with rough floor conditions. Its delicate handling is perfect for beverage and bottling companies. The 4-cylinder, dual overhead cam engine produces 52HP and 114 ft-lbs of torque at 1500 rpm for superior performance.